Fire, as everyone in the Western world knows, was bestowed upon humankind by the Greek Titan Prometheus, who stole it from the god of thunderbolts and lightning, the very, very frightening Zeus. Subsequently, throughout most of recorded history—and presumably everything that came before—people organized their lives around their ability to rekindle a flickering flame, lest they suffer from cold in the winter or the digestive distress of eating too much raw meat. Author and collector Ian Spellerberg’s interest in fire is somewhat less encompassing, limited to match holders, matchsafes, and vesta cases made in England and her colonies between the years 1830 and 1920. Those years coincide roughly with the date of the invention of the friction match in 1826 and the ubiquity of safety matches, cheap matchbooks, and cigarette lighters after World War I, all of which depressed the demand for devices designed to hold volatile sulfur- or phosphorus-tipped sticks. 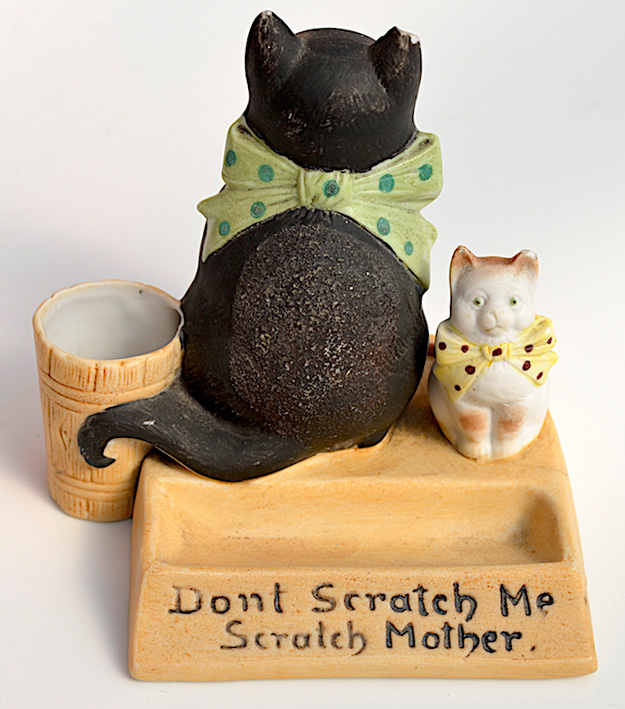 Top: In this humorous ceramic figurine, a kitten suggests that users should strike their matches on its mother’s rump. 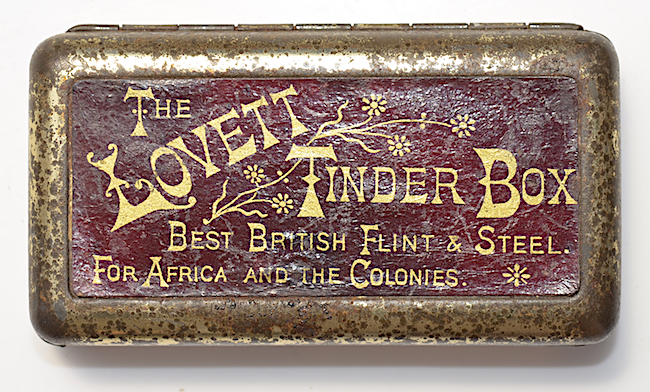 Above: The Lovett Tinder Box was introduced in 1899. It sold for a shilling, mostly in South Africa. If Spellerberg’s quest for fire is narrow compared to the element’s post-Promethean history, his passion for the topic burns no less bright, as seen in the entertaining and informative 2016 book he edited called Match Holders: First-hand Accounts of Tinderboxes, Matches, Spills, Vesta Cases, Match Strikers, and Permanent Matches. Comprised of photographs taken by Spellerberg and diary entries written by his late match-holder mentor, John McLean, Match Holders is a uniquely personal history of yet another class of objects that the world once considered indispensable but has somehow managed to live without. This small (under 4 inches tall) spill vase held splints for transferring a burning flame from, say, a fireplace or stove to a candle. To that end, many homes were dotted with decorative containers known as “spill vases” to hold slender pieces of wood called spills, splints, tapers, or splunks. These were used to transfer a flame from that permanently burning domestic fire to the candles that illuminated one’s abode. “Spills,” McLean writes in his diary, “were in use long after tinderboxes had largely been replaced by match holders.” But because matches were more valuable than spills, he writes, the use of spills to transfer flames was preferable to burning, and thus wasting, a perfectly good match. 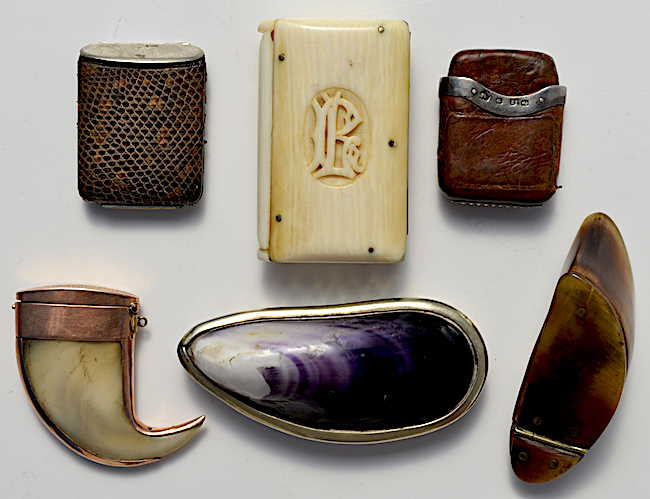 Victorian artisans were enthralled with the natural world, so little wonder that natural materials such as (clockwise from top left) snakeskin, ivory, leather, horn, shell, and tooth were used to construct match holders. In Match Holders, McLean seems especially taken with containers made from natural materials such as snakeskin, ivory, leather, tooth, shell, and horn—helpfully, Spellerberg gathered a collection of these very items together for a group photograph. The match holder and striker on the left was made by John McLean, whose diaries are the subject of Ian Spellerberg’s new book. The comic postcard at right merely offered a surface to strike. Pieces like these were likely made by jewelers or skilled artisans, but just as many match holders were fashioned out of more common materials such as felt and sandpaper by the people who used them. Also at the inexpensive end of the spectrum are comic postcards that offered users a surface to strike, the placement of which no doubt prompted Edwardian titters. 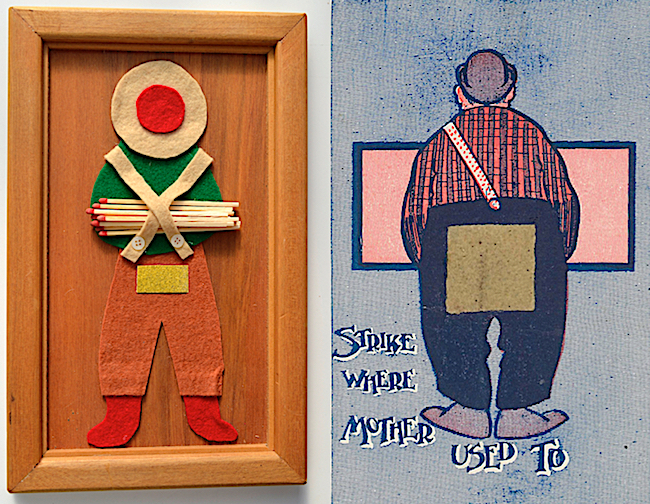 A parallel trend of the early 20th century was the comic figurine, whose dimensionality provided places for matches, both struck and unstruck, as well as a rough surface to set them alight. Three examples of ceramic match holders by (clockwise from top) Royal Doulton, Gouda, and Torquay potteries. Figurines were one form of ceramic match holder; small receptacles or vases were another. 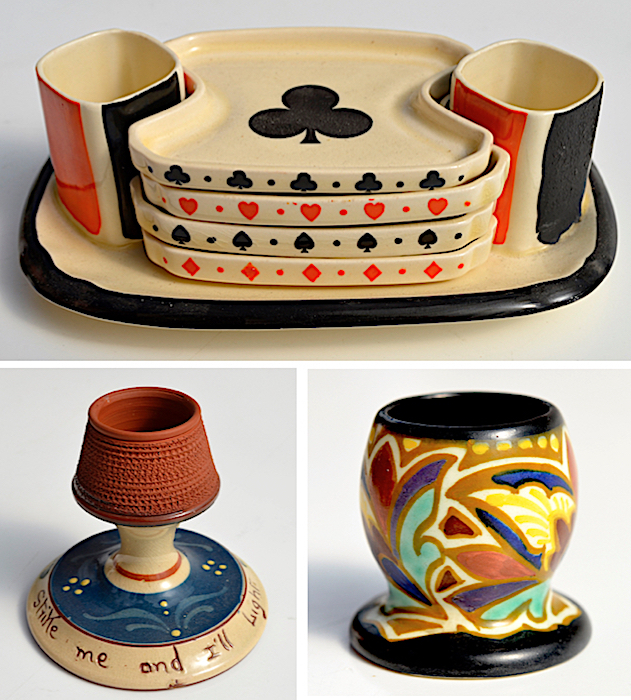 The venerable English pottery Royal Doulton made all manner of these sorts of holders, including one designed for a quartet of friends getting together for an evening of cards. This particular match holder featured two receptacles for matches plus four matching ashtrays, each bearing a spade, club, heart, or diamond. Other potteries known for their match holders were Carlton, Torquay, and Gouda. This novelty item from the 1880s held matches in its barrel and featured a depression in the top for trimming one’s cigar. Ceramic match holders enjoyed wide appeal because their designs tended to be in harmony with the rest of a home’s furnishings. In contrast, novelty vesta cases were less concerned about fitting in, as in the late 1880s pistol built for one handgun-happy cigar smoker. 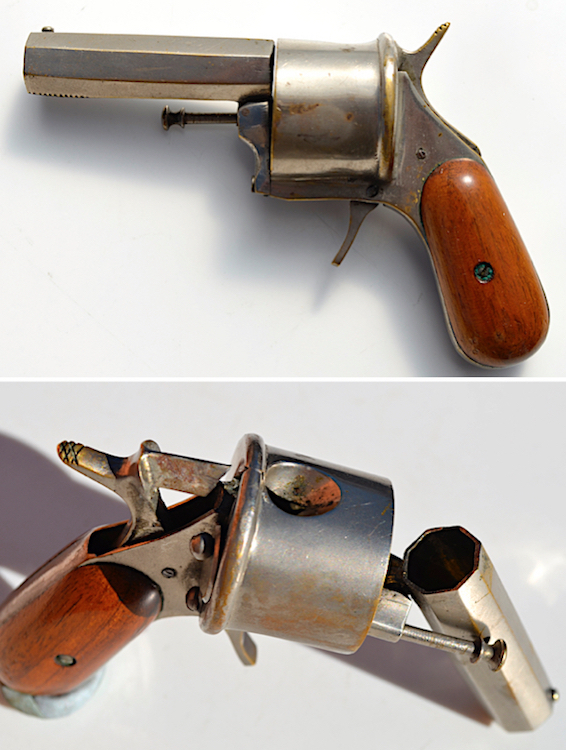 The pistol was nothing if not versatile, offering its owner two striking surfaces on the underside of its barrel—one for friction matches and another for safety matches—as well as a cigar cutter, which was operated by inserting the tip of a cigar into a depression in the top of the faux weapon, and then pulling the device’s trigger. Matches were stored in the barrel. 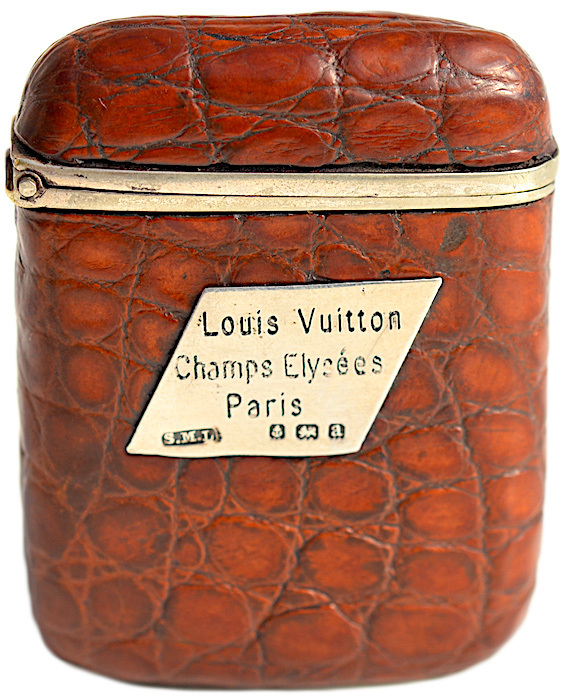 A Louis Vuitton match holder reveals how these utilitarian accessories were elevated to the realm of luxury goods. An object as multipurpose as that seems a long way away from a modest, utilitarian spill vase. It’s also fairly far removed from the match holders produced by such luxury-goods manufacturers as Tiffany & Co., Liberty, Hermes, and Louis Vuitton. Then again, who says fire can’t be fashionable? Rural Midwest, Us, schoolboys made match holders by splitting old tobacco cans horizontally, shortening them, and then fitting them back together.